Several more Thunderbirds are getting their chance in the professional spotlight here in Canada. 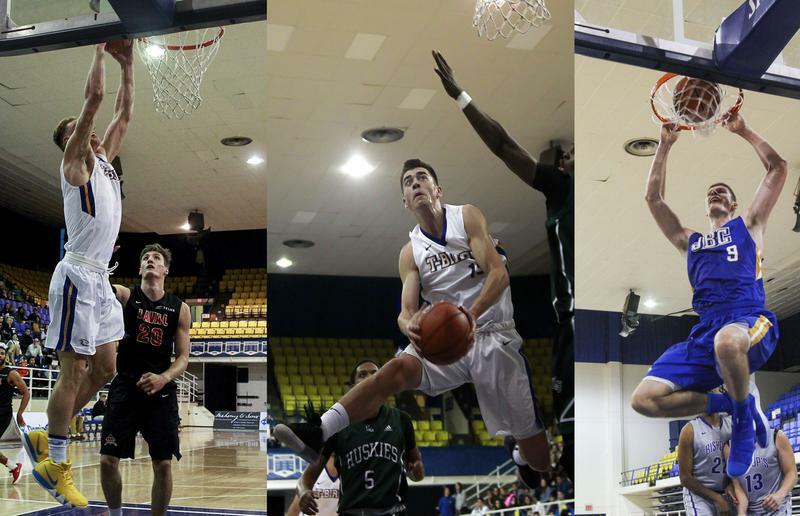 In the inaugural Canadian Elite Basketball League (CEBL) entry draft on March 23, four Thunderbirds got the call up to some of the league's teams: alumni Conor Morgan and Chad Posthumus, and current team stars Mason Bourcier and Grant Shephard. Morgan, Bourcier and Shephard were drafted by the Fraser Valley Bandits, while Posthumus heads to the Saskatchewan Rattlers. Morgan and Posthumus were the first of UBC’s select few to be drafted on the night, going in the open rounds. Prior to his graduation, Morgan was the back-to-back Canada West Player of the Year following a 2017/18 season that saw him finished third in Canada West with 23.9 points per game, and second in rebounds with 9.7 per game. He left the Thunderbirds third on the team’s all-time scoring list with 1,526 points. Posthumus was a member of the Thunderbirds roster from 2009 to 2011, before moving on to Howard College and Morehead State in the US. He has played in the Japan Basketball League, the Liga Nacional de Basquet in Argentina and most recently the National Basketball League of Canada. He has played for the Halifax Hurricanes for the last few months. In the U Sports round, guard Mason Bourcier went sixth overall, while teammate and forward Grant Shephard followed suit in seventh. Both were part of UBC’s starting lineup this season, though only in their second year on the roster. They featured in all 37 games for the Thunderbirds. Though not reflected in the scoring stats, Bourcier was a key component of UBC’s leadership this season — impressive for a sophomore. He put up 185 assists for the blue and gold in the 2018/19 season. He was also one of UBC's most vocal players this year, was arguably their best perimetre defender and ran the majority of UBC's offensive play. Similar to Morgan, Shephard took home a Canada West award last year as he was named the rookie of the year. This season, he was second in scoring for the Thunderbirds with 607, just behind NCAA Division 1 recruit Jadon Cohee. He led the Thunderbirds with 112 offensive rebounds, well ahead of their next best in Patrick Simon who had 64. He also had 218 defensive rebounds and 253 field goals made throughout the season. CEBL is the official professional league partner of Canada Basketball and has six teams across the country: the Fraser Valley Bandits (located in Abbotsford), the Edmonton Stingers, the Guelph Nighthawks, the Hamilton Honey Badgers, the Saskatchewan Rattlers (located in Saskatoon) and the Niagara River Lions (located in St. Catharines). Their season starts in May, with 20 regular season games from May 9 to August 15 and a playoff season to follow suit.